Get A Ticket Before the Next One Sells Out! We Still Have Seats In Our June 9, 2019 Cram Session. Reserve Your Spot Today! Our Early Bird, March 30, 2019 Bar Exam Cram Session is SOLD OUT! Our next offering will be on June 9, 2019. Secure your spot and be the first to get the Bar Exam Guru’s Predictions. The July 2019 California bar exam will be here before you know it. It is so important to get an early start on this ever so challenging exam. with such low pass rates on the California bar, it is critical to get a preview of where you need to be before the bar exam! Bar Exam Cram SessionTM is back by popular demand. Since our The early Bar Exam Cram Session sold out, we have opened a second Bar Exam Cram Session for June 9, 2019. This includes the highly sought after Bar Exam Guru’s bar exam predictions with selected essays to match with the predictions. Click here to learn more and to enroll today! Our Score MaximizerTM Bar Review Program addresses all aspects of the bar exam: Essays, MBEs and the Performance Test. This program is designed for both first time bar exam takers and repeat bar examinees. Our goal is to get you through the bar exam. Whether you are taking the bar exam for the first time or you are a repeat taker, our goal is to make this next bar exam your last. Bar None Review provides meaningful and detailed feedback on essay and performance exams so that students make quick progress. We pride ourselves on maintaining the quickest turn around time on our exams. Bar None Review provides exam writing templates for every tested topic. 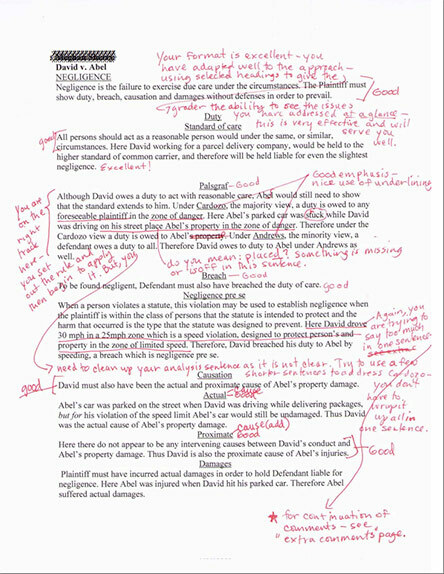 We think that if you take a look at a sample bar exam writing template that the value of these templates will be obvious. “I wish I had met you four years ago. I would have saved a lot of money and a lot of heartache. Thank you again for what you have done for me! Thanks to your Cram SessionTM, the bar exam is finally behind me and I owe it all to your program! It is a must have!” – Heidi Cheng, Esq. Click on the image below for a sample graded essay.